A total resource for info on buying and choosing baseball bats! It includes a directory, user reviews and ratings to help you choose the perfect baseball or softball bat! A year-round indoor baseball and softball facility, located in Littleton, Massachusetts. As of July 31, 2008, baseball coaches affiliated with Babe Ruth League, Inc. and Ripken Baseball, Inc. will be required to be certified. The Babe Ruth League Coaching Education Center web site provides information and resources to gain certification through online training. Additional detail, and content of the 1/19/07 Press Release is available here on the American Sport Education Program web site. The Mac League is comprised of Youth Baseball representation from Ayer, Shirley, Littleton, Groton, Dunstable, Pepperell and Townsend/Ashby. This site includes general, team, schedule and game results information for Babe Ruth and Cal Ripken Majors and Minors. 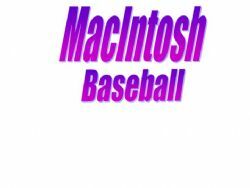 Click here for Macintosh League Rules and other Macintosh League documents. The Quality Coaching Baseball site provides baseball instruction, baseball drills, coaching philosophy, and other information for youth baseball coaches, players, and parents who want to learn more about playing and coaching baseball. Official Ripken Baseball site offering information that supports both amateur and professional baseball.